This was just lovely and worth the effort. I steamed it in pudding basin looking breakfast bowl in a normal saucepan with a lid on. I used some muslin in the greased bowl and plopped the mixture in then tied it over the top. I’m sure using some other materials like parchment paper and foil would work well too. Mix all the dry ingredients thoroughly. Add the rest of the ingredients and the milk, mixing to a dropping consistency. Pour into a well-greased pudding bowl and steam 1 ½ to 2 hours. 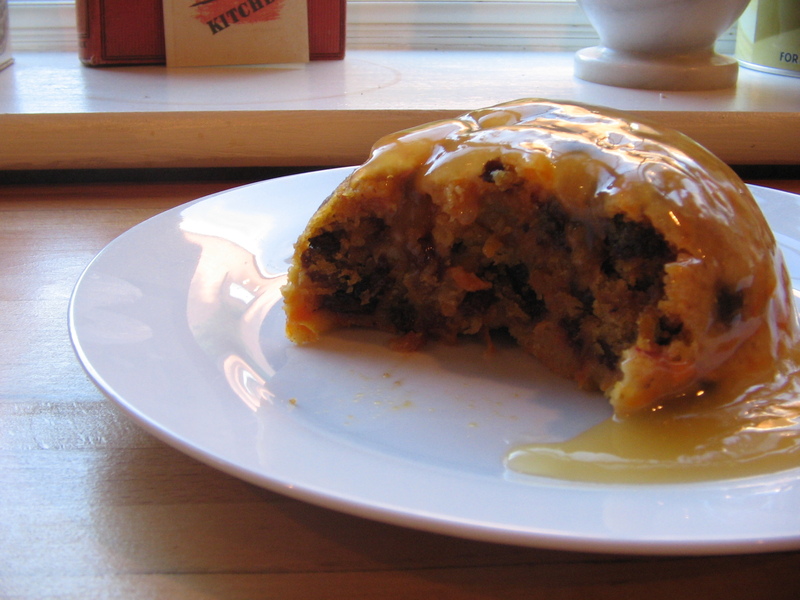 This entry was posted in Uncategorized and tagged carrot and sultana pudding. Bookmark the permalink. Any jam or syrup can be used as a sauce either in a jug at the table or pored into the steaming bowl before the mixture goes in to be cooked – this changes the texture of the top (when you invert it out onto a plate) as it becomes even more delicious. A couple of pineapple rings, apricot halves or slices of apple are another option, it’s always worth experimenting with whatever you need to use up. Ooo tasty, as I dropped my pud basin recently I shall try it in some individual pud pots and let you know the times. You could use a stainless steel bowl and use foil as a lid, works for me. have tried it and dumplings using half the amount of suet with either breadcrumbs or grated potato in its place. Was an old trick used by those ever so skilful war time cooks. I have the greatest respect for those ladies who coped with so much and still managed to put a swipe of red lipstick on and it was considered their duty to look well turned out. Breadcrumbs can also be replaced with either pre-cooked barley (unsalted), whole oats, flaked rye or left over toast reduced to crumbs in a blender. Try raw pear, apple, quince, potato or pumpkin to replace some or all of the carrot. It’s amazing the flavour sensations you can create when you find something in the cupboard, fridge or garden that needs to be used. This looks lovely and I look forward to the recipe for lemon sauce. I’ve seen a wartime method of steam cooking an entire meal together in one pot so that the use of fuel over 2 and1/2 hours isn’t profligate. Have you ever tried that or have you seen descriptions of this sort of cooking? Because I would think the only difficulty would be to time the separate components correctly. I’ve also seen it done at campsites, where you put a single pot on the fire to make a soup or stew and have the pudding on top acting almost as a lid. I have a large oval slow cooker & 2 stainless steel bowls that fit nicely, side by side inside my slow cooker. I cook a savoury in one and a sweet in the other to feed two adults. I actually have 3 slow cookers in total the 2 large round ones can take 1 large bowl or dish each so I can use those 2 together to cook for up to 8 adults. I place the filled dish in then top up with hot water to about 3/4 up the side of the filled dish or dishes. It really is that simple. I cook all sorts of things this way as it can be left to happily cook on low without the fear of burning. 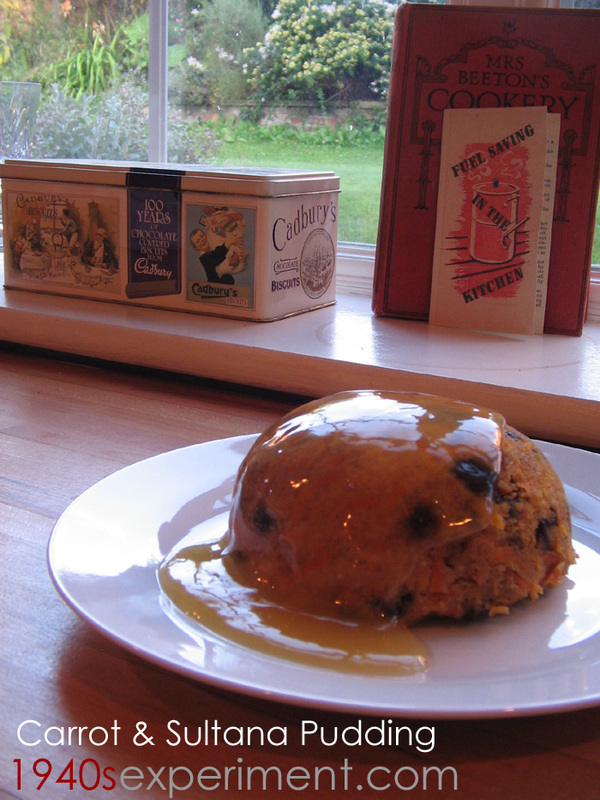 This pud looks absolutely scrummy but I cannot imagine it is going to help me in the weight loss department….tish! Used as an occasional after dinner yummy it is fine for someone who isn’t active – but for the active person – why not as a little of what you fancy does you good, as long as you only eat 1 portion of coarse. Beat altogether, pile into a bowl, cover and steam till firm and springy. Before cooking the puding you can put some syrup or jam in the bottom of the bowl with the mixture on top for a lovely sticky top to the pudding when turned out of the bowl. Stir altogether, pile into a bowl, cover and steam till firm and springy.